As folk have probably noticed, I've been a bit absent. For this I apologize. Sorry to everyone I've left in a lurch. Unfortunately life shows no signs of slowing down, so I am going to sign off. I wish you all well, and thank you for the memories. At the end of the Zakuul Rebellion, the Eternal Fleet went on a rampage. One of the planets targeted was capital world of the Galactic Republic. This thread is a place for detailing what your characters are doing during the Battle of Coruscant. The Custodian’s Watch (JC guildship) - Engineers will be engineering. Tacticians shouting into comm units, captains leading the ship. The Space Battle - Allied ships fighting the Eternal Fleet. Fighter squadrons shooting things. Stickjocks jocking. Orell Clinic - The Custodum’s forward base. Medics healing the injured and defenders fighting skytroopers. The Senate Tower - Defenders will be sifting through rubble, keeping senators alive, and convincing them to be helpful/get somewhere safe. The Shield Control Center - First someone needs to retake it, then repair the planetary shield controls, then defend it. For the first prompt most of the groundside fronts will be contained to shuttles, but starting with the second prompt all five will have action to take part in. Despite being hosted by the Jedi Custodum, anyone who’s character realistically could respond to the distress call can join in. Keep in mind that it’s the Eternal Fleet and skytroopers going on a rampage, not the Knights of Zakuul. Since this isn’t in-game, feel free to bring as many characters as you wish! Telline examined the cut on her arm. Already scabbed over; nothing to be done but let it heal. Over on her bed lay what had become her field robes. Gray strips of cloth that were unrecognizable as a Jedi garment. She carefully examined them for signs of wear, tears, or stains. She had failed. Not a serious loss. It would have been useful for the Senator to be seen capturing a Sith, but she didn’t have time for another attempt. Harkesone was worrying though. What might he do for the Sith, if she pressed him? She had seen that brand of stupidity before. A stump where an arm should be. A cackling Sith. A broken Jedi. Another time. Telline had work to do now. Telline gazed over her drink at the display. The rundown cantina had practically been her office only a couple years ago. Now it felt like one more battlefield. She focused on the news. Her failure to capture Lord Alnas was proving more damaging than she had hoped. Her coalition of Senators had, with some convincing, moved to lay charges against Saresh but the press was back in her pocket. They were going through the history of each of the senators, picking them apart and shifting the story just enough. The charges wouldn’t stick, despite Madon distancing himself. It was far from certain they would even make it off the floor at this rate. Telline remembered her vision. Fire raining from the sky. Mountains falling. Death wails all around. With disciplined ease, Telline forced her mind back to the present and muttered under her breath, “What the Senate cannot do, she will do to herself.” She would be perfectly primed to try something desperately stupid. Afterall, those with power fear, above all else, losing that power. Her old cronies were starting to see her as a liability. Her secrets had been revealed. What did she have left, other than her nerve? She dropped a few credit chits on the bar and walked out through the arched door. Telline allowed herself a small smile. It was improper, of course, to find satisfaction in another’s fall, but it was a tricky task completed successfully. Saresh’s fall was being reported across every news broadcast. As expected, Saresh had attempted to leverage control of the Alliance, and failed utterly. What would the Outlander do with her? Unknown. The answer to that question would reveal much about the Alliance’s enigmatic leader. But it would have to wait for another day. Telline left ops. After travelling down a few corridors and through a pair of lifts, she arrived at her quarters. She didn’t bother activating the lights - she knew the way. She sat cross legged at the foot of the bed and closed her eyes against the familiar shadows. She listened to the hum of the engines. She felt the energy of the crew. She focused on what was to come. OOC: Using this in RP - Ok, a few things I want to mention here. First, feel free to use the events in this post in your own RP, just remember Telline is very good at what she does and what she does is not get caught. Due to necessity, the timeline is a bit fuzzy (Thanks Bioware), but if you want to RP with one of my characters about these events, just tell me where in the progression you want the scene. Lastly, I know we generally have an agreement to keep away from main characters, but I couldn’t picture Telline not being involved. If this messes up your RP, feel free to ignore it. Telline is unlikely to ever admit to her role in Saresh’s fall, so it shouldn’t be an issue. I still wish it was Selkath, but I'm weird. The Striker hummed to life as she closed the cockpit. It had been a long time. "T4, set a course for Coruscant and put my notes on the screen. I'd like to get them organized before arrival." The droid made a few beeps and whistles in reply, and the filesystem with her notes appeared on screen. There were many of them. After five years on Erini there should be. But when she was done the Jedi would no longer have to rely on the woefully incomplete SIS factbook entry. The ship broke atmosphere and Telline looked at the nebula before her. There's a storm coming. I can feel it. Almost in answer, her thoughts replied No. The Storm is already here. You have been gone too long. Soon Telline would learn of the Second Great Galactic War, and take her place at the vanguard. Duration: 4 hrs roughly, with the possibility of reconvening later in the weekend if it goes long. Who: Anyone who is/have been involved with the Silence Keepers or the Architect. If you want to be involved or are not sure if you are involved, ask and I can get you involved. Imperial players may prefer to participate in Silence Keepers - Endgame http://begerencolony.org/forum/index.php?topic=1818.0. System: Minimal rolling. The enemies will be run by Ilireth. IC: The Architect has finally made a mistake. The White Knight is gathering allies to take down the Architect, once and for all. OOC: This is to wrap up some Silence Keepers threads Pub side as they relate to The Architect. I have only read a bit, but it looks awesome. Sometimes I get the urge to post things that seem either too short or too unimportant for their own post. They go here. "BREEP. Time To Wake Up. The Time Is Oh-Five-Hundred. Time to Wake Up. BREEP." Aradenn's feet hit the floor before the alarm's message finished. He crossed the floor of his bedroom quickly. His pants were on and he was fastening his uniform jacket before he remembered. Day off. He carefully undid his jacket and slipped off his pants, replacing them with simple civilian trousers and a shirt. He went to the window. It was dark still, as it had been since his first arrival on Kaas many years ago. Basic training. It was raining. In the distance was a flash of lightning. He entered the living room of his modest flat and turned on the holonet viewer. "-ther looks balmy today, with temperatures in the upper 80s. There is a 100% chance of rain." It was on a Kaas news channel. Aradenn sat on the couch across from it. "-peratures in the upper 80s. There is a 100% chance of rain." Aradenn jammed his finger on the remote and the screen turned off. He grabbed a magazine and a jacket and left his flat. Aradenn passed his credit chit to the woman across the counter. She swiped it and handed it back with his tea. He sat at a table under a canopy. He listened to the rain on the canopy and sipped his tea. He flipped open his magazine- Boots and Bulkheads, the Official Magazine of the Empire's Finest. He'd read it several times already, but it was better than nothing. Aradenn wandered the streets of Kaas. He felt rain land on his hat. He frowned. A regiment was marching down the street towards him. Aradenn stepped out of the way into a shelter. He watched them march past, water running off their polished black armor. Aradenn finished his ration bar and pocketed the wrapper. He looked up at the sky. The rain seemed to be slackening off. He walked towards the Physical Training Center. Aradenn sighed contentedly. It had been a good workout, even some 0-G training. He opened the door of the Center, and let it close again. The rain was pounding the walkway. Aradenn scowled. Aradenn checked the powercell in his pistol. He took up a firing stance and waited for the call. "Ready...Ready...FIRE!" Aradenn opened fire. "Switch weapons!" He dropped the pistol and quickly raised the rifle next to him. "Ready...Ready...Ready...FIRE!" Aradenn opened fire again. "Scores will be on the displays in front of you." Aradenn stood at a store front in the market. In the window was a model Harrower-class Dreadnought. He stood there for awhile, admiring the detail. And avoiding the price. He eventually moved on, to gaze at the monument across the plaza. He reached into his pocket and unwrapped another rat-bar. A few minutes later he pocketed the wrapper, and turned towards home. I think I'll go to the office early tomorrow. "Kriff! Slow down! You're going to get us caught!" Between the wind and the echoing sounds of Crevasse City's night life, Lady Reiyan Killesa could barely hear her brother's complaints. She yelled back, "Oh, give it a rest you nerf! You know we're on a time table." "Come on Rei, we lose it all if the guard catch us." Reiyan sighed. "Fine, fine." She slowed to a more reasonable speed as tilted the nose of the speeder up. Crevasse City was so named because it was built into the walls of a narrow canyon in the northern tundra. It was one of the larger cities on Alderaan, and certainly the most impressive. It managed to be a fully modern city without disrupting the natural landscape. She saw her objective and glanced at the speeder's chronometer. Ralle should still have the attention of the Thuls. Hopefully. She chided herself. Of course they're distracted. It's what he does. It's why he's in your cell. She looked over to her brother. "Ced, you have all the charges?" Cedarik pulled a heavy bag from the floor of the speeder into his lap and began counting the charges within. "Yep. Six charges. You're sure that will be enough?" "It should be more than enough. I'm bringing us in. Get ready to hop out." She smoothly brought the speeder over the lip of the canyon just hundred meters from the sensor station. His target. She slowed the speeder to a near stop and Cedarik leaped over the side and fell a meter with a thud. Reiyan smoothly brought the speeder back up to speed and soared over the opening of the canyon to the far side. She brought the speeder to a stop outside the Imperial wardpost. Two soldiers in black armor approached the speeder. "Ma'am, this is a secure area. You can't land here." "I'm sorry sir. I'm having trouble with my engine. It's my brother's speeder and he said to be careful flying down into the wind if it was giving me any trouble... I was hoping someone here could help me." That was a lie of course. He brother wouldn't know how to buy a decent speeder. She gave the guard her sweetest smile. The guards paused, mulling it over. The less experienced one, the one who had not spoken yet, looked to the one that had spoken. "Hm. Let me take a look at it, but then you need to get out of here. Unlock the hood." She did as she was told, and the front plating of the speeder lifted, revealing the engine. She then got out of the speeder to look at the inner workings with the trooper. He peered for a moment before lifting his helmet for a better view. He leaned forward to get a closer look. Reiyan took the opening. The metal hood hit the soldier hard on the back of the head and he collapsed. The second one lifted his rifle but Reiyan was close enough to grab it and she shoved the aperture towards the ground. The guard responded with a backhanded strike to her face and she reeled. As she came back up, vibroknife in hand, the soldier had brought his rifle back on line. He hesitated for just a moment, but a moment was all she needed. She rushed him, pushing past the rifle and knocking him to the ground. She quickly shoved the point of her knife under the front lip of the soldier's helmet and powered the knife on. There was a gurgle as he tried to scream while thrashing about, and then he was still. Reiyan stood, looking at the blood on her hands. She returned to the trooper by her speeder. He was only unconscious. If he lives, he'll tell his superiors who you are... She slit his throat. She looked at the wardpost. It was comprised of one multistory building with an attached courtyard. No alarms. Good or lucky? Doesn't matter right now, just get the job done. She grabbed her bag from her speeder. She ran up next to the wall of the building and pulled the mining charge from her bag. Five seconds. She left it leaning against the wall and returned to her speeder. She gunned the engine and dropped it over the lip of the canyon, out of sight of the wardpost. She slowly brought the speeder to the edge of the canyon near the sensor station. As she came to a stop, Cedarik dropped into her speeder from above. She pushed the speeder into a dive. Lord Ralle Wymarc looked out the window of the ballroom, and counted under his breath. Three, Two, One... He saw two bright lights appear in the night, one on either side of the canyon. A dull rumble followed a few moments later. Ralle sipped his wine, and turned from the window. Roleplay Workshop / Light side and dark side, a religious perspective. Yep, it's that thread again! From what I've seen there are two ways people look at the Force, and interestingly enough, it depends on what they use as a metaphor for it - Eastern religion or Western religion. Just to be clear, when I say Western Religion I'm looking at Judaism/Christianity/Islam and when I say Eastern Religion I'm mostly looking at Taoism. Starting with the Eastern viewpoint, since that's the one I subscribe to, The Force is similar to Tao, essentially the underlying structure of the universe. The problem with using Taoism as a model is that in Taoism good and evil don't really exist. The solution, which I had trouble grasping until Iaera pointed it out to me, is instead of looking at good and evil, look at Order and Chaos. Light side is upholding the order of the Force, the balance. Dark is to create your own order, impose your own will on the Force. This is why Force lightning is a dark side power - it is creating something from nothing, imposing one's own order on the universe. "But isn't that what Jedi do all the time? Convert those who disagree and lie and manipulate to make events pass as they desire?" Yep. You caught them. They totally impose their will on the galaxy. They avoid going dark in two ways: 1) They try to impose the Force's order, not their own, 2) They adhere to a strict set of rules that severely limit the personal goals they have. I feel the Western viewpoint is popular because of the good/evil problem - the monotheistic religions most certainly have good and evil themes and tend to be better known by Western audiences. But they do have trouble with the idea of balance, specifically balance as stated in the movies, the primary canon. Anakin is described as being destined to "bring balance to the Force." If balance means equal parts good and evil, that is light and dark, I don't think he succeeded. Prior to Order 66, it was 2 Sith vs thousands of Jedi. After Order 66 and the purge it was 2 Sith vs two Jedi, both retired. After Endor, it was one maybe-Jedi. Perhaps the prophecy was about Order 66, but I don't think so, given that would require every one of those thousand Jedi, including Obi Wan, Yoda, and Windu, being completely incompetent and unable to see that they were the ones bringing the Force out of balance. That's the main reason why I prefer the Eastern interpretation. Grey Jedi: Grey Jedi exist in both viewpoints, but in different fashions. From the Western viewpoint they are seen as neutral, neither good or evil. From the Eastern viewpoint they are seen as pressing the envelope of what a Jedi is allowed. In the movies there is no example of a grey Jedi as defined from the Western viewpoint, but Qui-Gon Jinn is a good example of a Grey Jedi from the Eastern perspective. He is a bit arrogant and overly sure of the will of the Force, ie natural order, is and doesn't question whether it's the will of the Force or his will he's acting on. It's also worth pointing out that, according to the movies, the dark side corrupts. A lot. Anakin goes from occasional bouts of rage to baby killing in about 5 minutes. And shows no remorse for it. No one's perfect, but it's not a gentle slope from light to dark. It seems to be more like a cliff. Coexistence: How can people playing with both viewpoints rp together without annoying each other? Easily. 'Good' is often defined as following God's will. The order imposed by God. Replace God with the Force and there is no issue. Not with Dark/Lightsiders anyways. Grey Jedi on the other hand don't seem to fit as well. Grey Jedi from the Western perspective are Dark Siders from the Eastern perspective. How can that be reconciled? I don't know. But I intend to put some thought towards it. Outside Realm / Cards Against Humanity Online! So, I've come across a fair amount of confusion concerning astrogation, the Treaty of Coruscant, and recent history. Because of this, I've decided to do a short write-up (with pictures!) of the changes in galactic politics since the rise of the new Sith Empire. This is the best I've been able to trow together, based on available lore. To make this easy, I'm using the galaxy map from in-game. 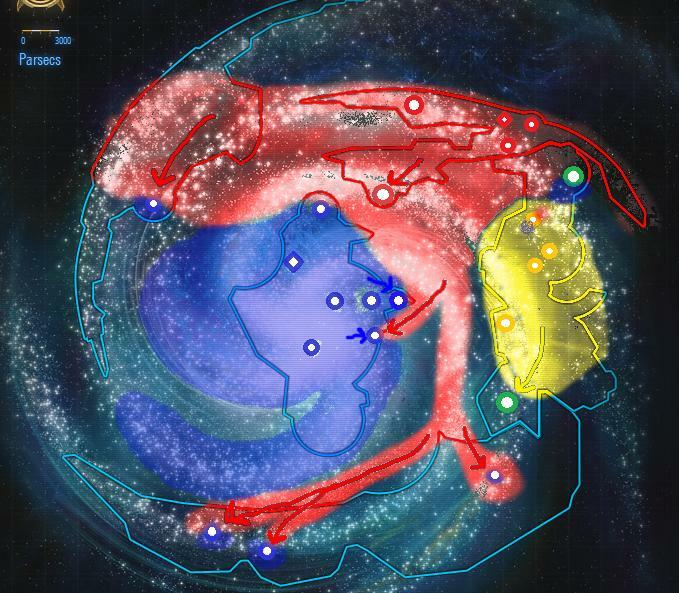 As you can see, I've marked the planets that are there in-game, the two factions fleets, Csilla, and Kwenn. I tried to get the locations of the planets right, but I'm sure they're a little off. I've already been informed that Csilla is not far enough west, please don't shoot me my Chiss friends. The important thing is that it's on the same side of the galaxy as the Empire and away from Republic influence. Also, apologizing now, I do not have Rise of the Hutt Cartel, so information concerning Makeb may be incorrect. A note on color: Blue is Republic, Red is Empire, Yellow is Hutt, Green is Independant. This map is before the Great Galactic War. The Empire is expanding west from Dromund Kaas, at some time encountering the Chiss Acendancy. Voss is undiscovered. The Republic is in a period of growth and expansion, and it's influence is felt even in the Outer Rim. Belsavis is made into a prison shortly before Great Galactic War begins, with it's own dedicated garrison. 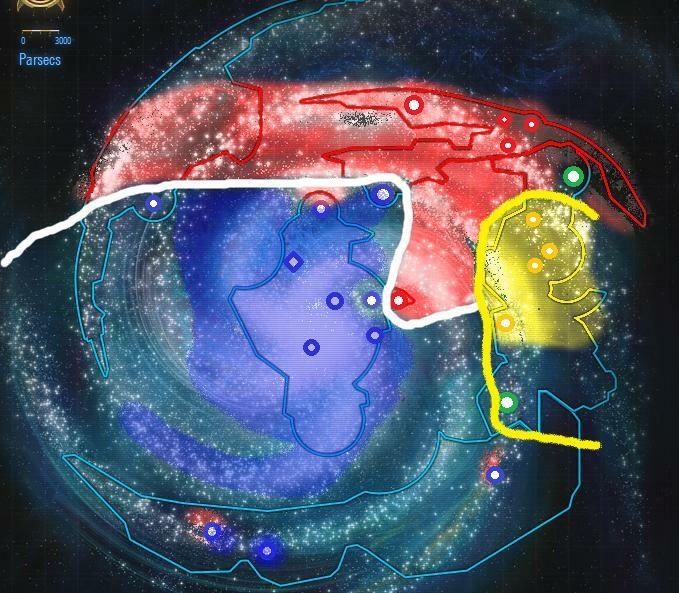 The Great Galactic War open as the Empire advances down the Tengel Arm, shown by the small arrow in the Seat of the Empire. As the Republic scrambles to reposition it's military, the Senate falls into chaos as worlds are prioritized. Many systems leave. This is shown by the Blue arrows to the Core Worlds from the west. While the Republic is off-balance, the Empire advances through the Outer Rim, almost unchecked. The Republic manages to cripple their fleet at the Battle of Hoth, but the Empire has already established bases on several Rim worlds. Note that The Empire does not yet know the location of Belsavis. The primary Imperial assault comes through the corridor near Hutt Space, before stalling at the sieges of Bothawui and Balmorra. After the failure of the Mandolorian Blockade, the Empire goes on the offensive again, hitting, but unable to hold the Core Worlds including Alderaan. The final, and most well known move of the War is the Sacking of Coruscant. Also of note: At some point during the war, Manaan is bombed by the Sith and the Selkath abandon the surface and galactic politics/trade. As such, Manaan is no longer exporting kolto. Based on how the Treaty is described, I'm using http://en.wikipedia.org/wiki/Treaty_of_Tordesillas as model. 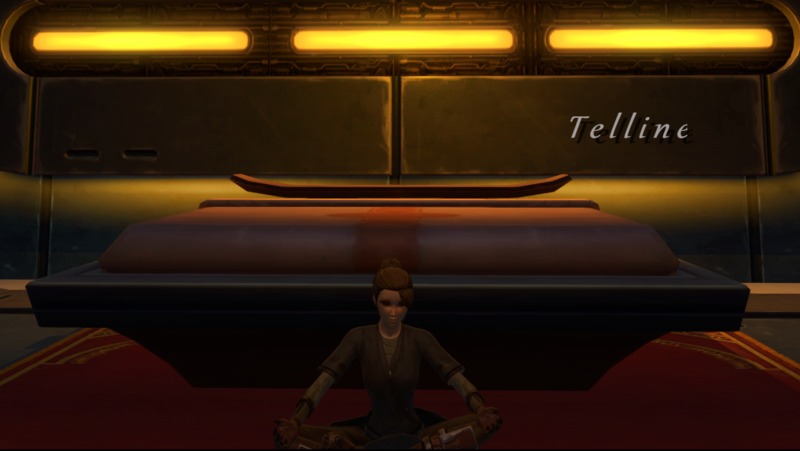 Planets visited in-game during this period: Tython, Ord Mantell, Korriban, Hutta, Dromund Kaas, Coruscant, pub!Taris, imp!Balmorra, Nar Shaddaa, Tatooine, Alderaan. By the terms of the Treaty of Coruscant, all space south of the white line is Republic space, all space north of the line is Imperial Space. 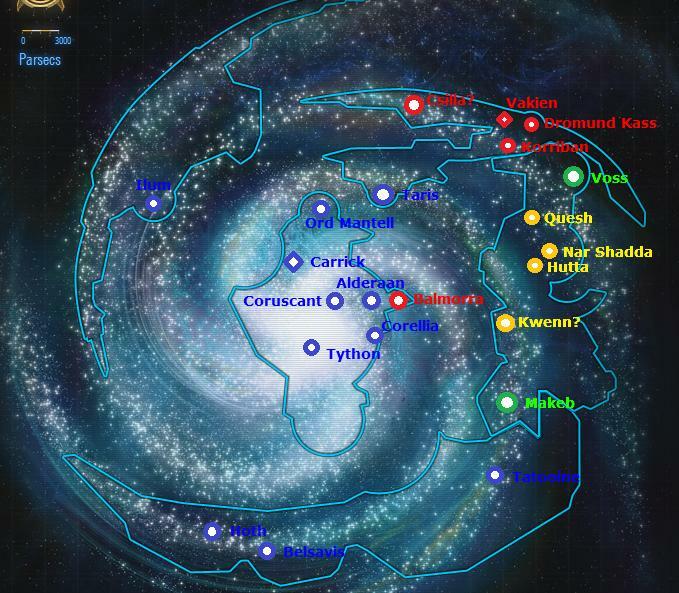 Note that Alderaan is independant, but in Republic space since they seceded after the Treaty was signed. The Hutt Cartel managed to either ignore the Treaty or be written out of it, allowing movement of either faction through their space. Diplomatic vessels are allowed to cross the Treaty Line, but they are watched closely. 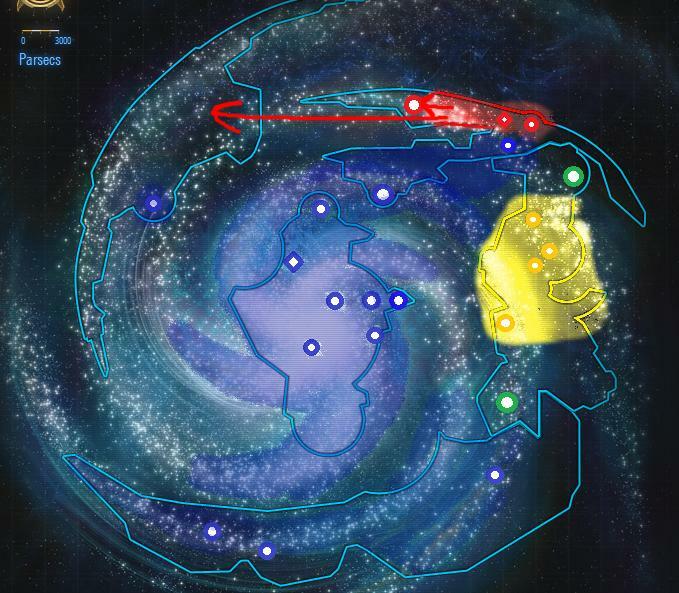 Smugglers and other fringers travel through uninhabited systems and Hutt Space to move between the factions. The Republic during this period focuses on regaining the support of the mid rim systems that became disillusioned during the war. Alderaan secedes just after the Treaty is signed. Note that though The Treaty divides Imperial and Republic Space, The respective factions do not actually control the entirety of their regions. This is further complicated by the Imperial Outer Rim bases that the Republic does not have knowledge of or the resources to root out. Imperial operations in the Outer Rim are technically in violation of the Treaty Of Coruscant, but the Republic does not have a firm enough grasp of the territory to stop said operations. That said, should the Republic fight against the Imperial operations there, they would not be in violation of the Treaty. Belsavis is an exception. It is unclear just how strong the garrison is, but it is strong enough to prevent smugglers from landing (source: One of the Republic quests on Belsavis). Voss is discovered during this period, and the Empire attempts to invade. Though the Republic offers to assist, almost reigniting the War, the Voss are able to fight off the Empire on their own. Tython is rediscovered shortly after the Treaty is signed. Planets visited in-game during this period: Makeb, Ilum, Corellia, Voss, Belsavis. Guess what? Just to make things more difficult, for some classes Act II is war, for some it is not. THANKS BIOWARE. In order to explain the Act II war/peace problem, I am thinking the Empire starts openly ignoring the Treaty. The Republic begins reacting before the Declaration of War clears the Senate. ANYWAYS. The opening moves of the new war are the Imperial invasion of Taris and the Republic liberation of Balmorra. At the same time the Imperial bases in the Outer Rim are reinforced and begin fighting Republic forces on Hoth and Belsavis. Both the Republic and the Empire increase the scale of their diplomatic missions to Voss. The Empire's first major move in the war is the invasion of Corellia, which is countered shortly after by the Republic. The Empire then discovers and attacks Ilum. Both sides experience tension with the Hutt Cartel on Quesh, and then even more so after the Hutt Cartel begins to expand by attacking Makeb. Sources: http://www.swtor.com/holonet/galactic-history, http://www.swtor.com/holonet/planets/, Jedi Knight story to 50, Consular story to 50, Imperial Agent story to Act II, Smuggler story to Act II, Wookiepedia. Captain Michels awoke. This was unexpected, but not unwelcome. He was in a friendly green room, with friendly brass detailing, a very friendly table, with some very tasty food, and a very very friendly man with a funny copper goatee and a friendly green doublet. The very very friendly man was talking to him. Asking him something... Ah yes. He wanted to know who he was working for. And where he was taking the cargo. "Oh, but I work for the Silent Keepers. Not all that silent really. Hard to tell me where to take stuff if you're silent. Also hard to sing. I AM THE VERY MODEL OF A SILENT SPACER-"
The very very friendly man held up a hand. "Yes, of course you are. But where were you going?" Michels drank some very tasty wine. "Oh, I was to hand it off in the Sigma Aurek-1137. I don't know where it was going from there." The very very friendly man stood up, and with a very friendly frown drew his very friendly blaster and shot a not as friendly bolt between Michel's eyes. I'm currently drooling over the Bindo set. And the Matriarchal set. And I might actually like the silver-blue crystal. And the HOLOPROJECTOR DISGUISE! Jace, you might want to check out that Troublemaker Coat.